It’s been nearly a year that I discussed with a friend about mainstream education. Being the parent of neurotypical children, I had some preconceptions about how mainstreaming works to promote inclusion and it’s benefits for kids with special needs. I was shocked to hear about how much of her childrens’ days were spent in “adaptive” classes and how many of these classes are located in remote areas of school, often separated from all the other classrooms. Not only are students who attend school in the special education classrooms often separated from their peers, they frequently spend lunch times in a designated area of the lunch room. Does anyone else see a problem with this? Does this look like segregation to anyone else? I need to say now that this parent chose this particular school because it is more progressive and puts more effort and energy into providing better education and socialization for kids with special needs. Her children attend this school because it strives to provide her children what they need for both inclusion and academics. But without criticizing the good things the school strives to achieve for all students, can we agree that more can be done? That we, collectively, can do better? Since there is no way that I can speak to the issues of having kids with special needs in public education, I want you to think about why this problem might exist in the first place, and how we may impact inclusion in a different way. Merriam-Webster defines marginalization as such, “to put or keep (someone) in a powerless or unimportant position within a society or group.“1. For people with disabilities, this means they must invest more energy and more resources in order to get what they need. They have to fight to be heard, to secure access to resources that others can easily obtain and to be seen as an invaluable part of our population. Value is something with which people are born, not something for which people should have to fight when they often have such little capability to do so. Individuals with disabilities may need people to advocate for them. For children, the tasks of advocacy frequently falls to their parents and/or caregivers. As they get older, some children will be able to take on the role of a self-advocate. Can we do anything to help support families advocating for their loved ones? What can we do to encourage people to advocate for themselves? Since I honestly believe that babywearing has the potential to help everyone in the world with at least one of their challenges, I want to talk about how caregivers can use babywearing to decrease the effects of marginalization for their little ones. 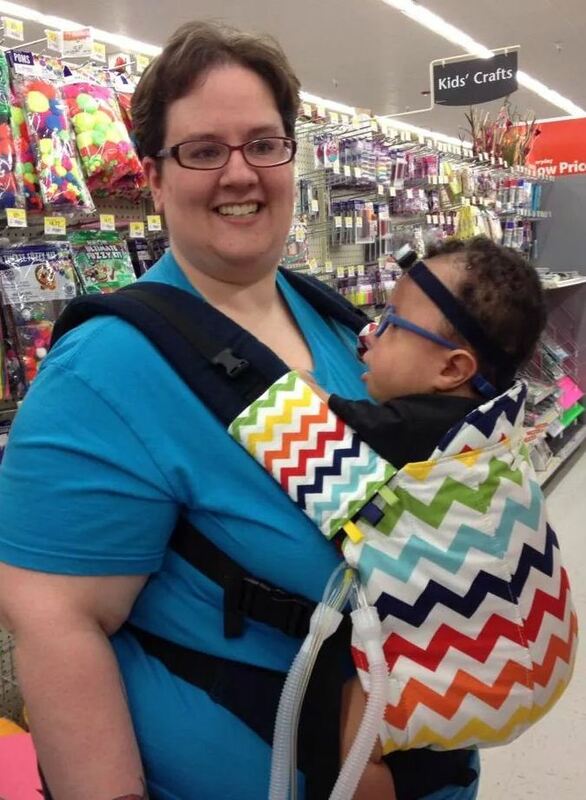 First, babywearing can promote inclusion by making it easier for caregivers to interact with others in public. This is an example from a blog of a local mom. Her daughter, Tessa, uses a wheelchair, cochlear implants and has cortical visual impairment. As her daughter transitioned from early supports to use of a wheelchair it became more difficult to continue including her in family activities. A friend suggested babywearing as a possible tool for inclusion. I mentioned back in early November about looking forward to new experiences carrying Tessa in our new [baby carrier]. It has been a blast! We walk around the pond together, we jump in bouncy houses together, we swing & play on playgrounds together, we grocery shop together, we hike together, we walk on the treadmill together, and she takes naps, great naps, in her pack…even during Sunday morning church 😉 And last week I was so excited to get Tessa the next size up! A dear friend found her this preschool carrier. I just love this print called “Going Places”….it’s so appropriate since these [carriers] open up a whole new world of ‘going places’ for us and Tessa!!2. Whitney and all three kids on an evening stroll. “My son Ameir is 3 years old. He is non mobile and uses a wheelchair due to medical issues associated with Trisomy 18. He also has a trach, is on a ventilator, and has a gtube (gastric tube). When I wear him I feel like his disability is less intimidating to other people. We are approached more often for conversation and interaction when I wear him than we are when I push him in his wheelchair. He is more alert and interactive with people as well.“3. Amy and Ameir on a shopping trip. Now that you’ve read what Amy wrote, can you remember times that you’ve felt nervous or uncomfortable when in the presence of someone who uses medical equipment? Maybe you end up talking to the parent when you really should be talking to the child. Maybe you’ve avoided interacting with people who have tracheostomies or cochlear implants because you don’t know how to communicate with someone who communicates differently than you do. The reason I might sound passionate is because I’ve recognized that I have done these things. I’ve spoken to the parent of a child who uses a wheelchair when I should have spoken to both the parent and the child. Even if the parent is the one answering for both of them, the child deserves to be spoken to directly. Third, babywearing has the potential to promote advocacy within the family. Using results on a study including infants in the intensive care unit, skin-to-skin care causes caregivers to see their children as being “normal” as opposed to “sick” or “disabled”.4. We could use some research to see if this result can be duplicated in older children whose parents wear them in carriers. Also, are kids whose parents advocate for them more likely to advocate for themselves as they age? Does the motivation for self-advocacy begin in childhood? Babywearing does not work for everyone. I try to periodically remind myself of that fact because I tend to forget. But for some people, babywearing can be a tool to positively change a child’s life trajectory. 3. Personal communication, Amy Reed, 9/14/2015. 4. Tessier, R., Cristo, M., Velez, S., Giron, M., de Calume, Z., Ruiz-Palaez, J., Charpak, Y., Charpak, N. (1998). Kangaroo mother care and the bonding hypothesis. Pediatrics, 102(2), 17. Shelly Greenhaw, Board President for Oklahoma Family Network, for her invaluable conversations and patience with my learning curve. Your energy and love for your family inspires me. Ashley Vogel, for her powerful suggestion of babywearing. Thank you for taking the risk. You changed lives. Whitney Bynum for allowing me to quote her blog and share her photos to educate healthcare professionals about therapeutic wearing. I’m a Whitney fangirl. Amy Reed, for giving me the confidence to talk about wearing children with complicated medical equipment. I love seeing jaws drop when I share your photographs. 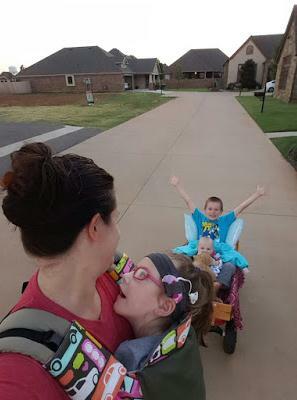 This entry was posted in Inclusion, therapy for populations with disabilities and tagged babywearing, cerebral palsy, disability, inclusion, marginalization. Bookmark the permalink.